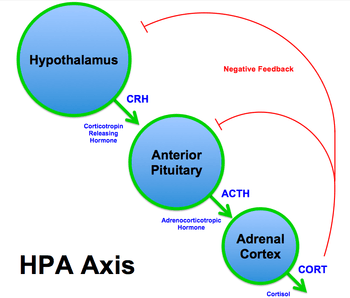 Basic HPA axis summary (corticotropin-releasing hormone=CRH, adrenocorticotropic hormone=ACTH). 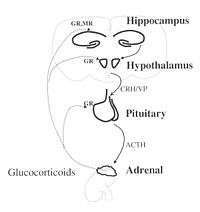 Hypothalamus, pituitary gland and adrenal cortex. 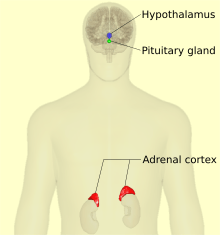 The hypothalamic–pituitary–adrenal axis (HPA axis or HTPA axis) is a complex set of direct influences and feedback interactions among three endocrine glands: the hypothalamus, the pituitary gland (a pea-shaped structure located below the hypothalamus), and the adrenal (also called "suprarenal") glands (small, conical organs on top of the kidneys). These organs and their interactions constitute the HPA axis, a major neuroendocrine system that controls reactions to stress and regulates many body processes, including digestion, the immune system, mood and emotions, sexuality, and energy storage and expenditure. It is the common mechanism for interactions among glands, hormones, and parts of the midbrain that mediate the general adaptation syndrome (GAS). While steroid hormones are produced mainly in vertebrates, the physiological role of the HPA axis and corticosteroids in stress response is so fundamental that analogous systems can be found in invertebrates and monocellular organisms as well. The HPA axis, HPG axis, HPT axis, and the hypothalamic–neurohypophyseal system are the four major neuroendocrine systems through which the hypothalamus and pituitary direct neuroendocrine function. Vasopressin can be thought of as "water conservation hormone" and is also known as "antidiuretic hormone." It is released when the body is dehydrated and has potent water-conserving effects on the kidney. It is also a potent vasoconstrictor. Cortisol produced in the adrenal cortex will negatively feedback to inhibit both the hypothalamus and the pituitary gland. This reduces the secretion of CRH and vasopressin, and also directly reduces the cleavage of proopiomelanocortin (POMC) into ACTH and β-endorphins. Epinephrine and norepinephrine (E/NE) are produced by the adrenal medulla through sympathetic stimulation and the local effects of cortisol (upregulation enzymes to make E/NE). E/NE will positively feedback to the pituitary and increase the breakdown of POMCs into ACTH and β-endorphins. Release of CRH from the hypothalamus is influenced by stress, physical activity, illness, by blood levels of cortisol and by the sleep/wake cycle (circadian rhythm). In healthy individuals, cortisol rises rapidly after wakening, reaching a peak within 30–45 minutes. It then gradually falls over the day, rising again in late afternoon. Cortisol levels then fall in late evening, reaching a trough during the middle of the night. This corresponds to the rest-activity cycle of the organism. An abnormally flattened circadian cortisol cycle has been linked with chronic fatigue syndrome, insomnia and burnout. The HPA axis has a central role in regulating many homeostatic systems in the body, including the metabolic system, cardiovascular system, immune system, reproductive system and central nervous system. The HPA axis integrates physical and psychosocial influences in order to allow an organism to adapt effectively to its environment, use resources, and optimize survival. Increased production of cortisol during stress results in an increased availability of glucose in order to facilitate fighting or fleeing. As well as directly increasing glucose availability, cortisol also suppresses the highly demanding metabolic processes of the immune system, resulting in further availability of glucose. There is bi-directional communication and feedback between the HPA axis and immune system. A number of cytokines, such as IL-1, IL-6, IL-10 and TNF-alpha can activate the HPA axis, although IL-1 is the most potent. The HPA axis in turn modulates the immune response, with high levels of cortisol resulting in a suppression of immune and inflammatory reactions. This helps to protect the organism from a lethal overactivation of the immune system, and minimizes tissue damage from inflammation. The CNS is many ways "immune privileged," but it plays an important role in the immune system and is affected by it in turn. The CNS regulates the immune system through neuroendocrine pathways, such as the HPA axis. The HPA axis is responsible for modulating inflammatory responses that occur throughout the body. During an immune response, proinflammatory cytokines (e.g. IL-1) are released into the peripheral circulation system and can pass through the blood brain barrier where they can interact with the brain and activate the HPA axis. Interactions between the proinflammatory cytokines and the brain can alter the metabolic activity of neurotransmitters and cause symptoms such as fatigue, depression, and mood changes. Deficiencies in the HPA axis may play a role in allergies and inflammatory/ autoimmune diseases, such as rheumatoid arthritis and multiple sclerosis. The relationship between chronic stress and its concomitant activation of the HPA axis, and dysfunction of the immune system is unclear; studies have found both immunosuppression and hyperactivation of the immune response. Schematic overview of the hypothalamic-pituary-adrenal (HPA) axis.Stress activates the HPA-axis and thereby enhances the secretion of glucocorticoids from the adrenals. The HPA axis is a feature of mammals and other vertebrates. For example, biologists studying stress in fish showed that social subordination leads to chronic stress, related to reduced aggressive interactions, to lack of control, and to the constant threat imposed by dominant fish. Serotonin (5HT) appeared to be the active neurotransmitter involved in mediating stress responses, and increases in serotonin are related to increased plasma α-MSH levels, which causes skin darkening (a social signal in salmonoid fish), activation of the HPA axis, and inhibition of aggression. Inclusion of the amino acid L-tryptophan, a precursor of 5HT, in the feed of rainbow trout made the trout less aggressive and less responsive to stress. However, the study mentions that plasma cortisol was not affected by dietary L-tryptophan. The drug LY354740 (also known as Eglumegad, an agonist of the metabotropic glutamate receptors 2 and 3) has been shown to interfere in the HPA axis, with chronic oral administration of this drug leading to markedly reduced baseline cortisol levels in bonnet macaques (Macaca radiata); acute infusion of LY354740 resulted in a marked diminution of yohimbine-induced stress response in those animals. It is also known that HPA axis hormones are related to certain skin diseases and skin homeostasis. There is evidence shown that the HPA axis hormones can be linked to certain stress related skin diseases and skin tumors. This happens when HPA axis hormones become hyperactive in the brain. Schematic overview of the hypothalamic-pituary-adrenal (HPA) axis. Stress activates the HPA-axis and thereby enhances the secretion of glucocorticoids from the adrenals. There is evidence that prenatal stress can influence HPA regulation. In animal experiments, exposure to prenatal stress has been shown to cause a hyper-reactive HPA stress response. Rats that have been prenatally stressed have elevated basal levels and abnormal circadian rhythm of corticosterone as adults. Additionally, they require a longer time for their stress hormone levels to return to baseline following exposure to both acute and prolonged stressors. Prenatally stressed animals also show abnormally high blood glucose levels and have fewer glucocorticoid receptors in the hippocampus. In humans, prolonged maternal stress during gestation is associated with mild impairment of intellectual activity and language development in their children, and with behaviour disorders such as attention deficits, schizophrenia, anxiety and depression; self-reported maternal stress is associated with a higher irritability, emotional and attentional problems. There is growing evidence that prenatal stress can affect HPA regulation in humans. Children who were stressed prenatally may show altered cortisol rhythms. For example, several studies have found an association between maternal depression during pregnancy and childhood cortisol levels. Prenatal stress has also been implicated in a tendency toward depression and short attention span in childhood. There is no clear indication that HPA dysregulation caused by prenatal stress can alter adult behavior. The role of early life stress in programming the HPA Axis has been well-studied in animal models. Exposure to mild or moderate stressors early in life has been shown to enhance HPA regulation and promote a lifelong resilience to stress. In contrast, early-life exposure to extreme or prolonged stress can induce a hyper-reactive HPA Axis and may contribute to lifelong vulnerability to stress. In one widely replicated experiment, rats subjected to the moderate stress of frequent human handling during the first two weeks of life had reduced hormonal and behavioral HPA-mediated stress responses as adults, whereas rats subjected to the extreme stress of prolonged periods of maternal separation showed heightened physiological and behavioral stress responses as adults. Several mechanisms have been proposed to explain these findings in rat models of early-life stress exposure. There may be a critical period during development during which the level of stress hormones in the bloodstream contribute to the permanent calibration of the HPA Axis. One experiment has shown that, even in the absence of any environmental stressors, early-life exposure to moderate levels of corticosterone was associated with stress resilience in adult rats, whereas exposure to high doses was associated with stress vulnerability. Another possibility is that the effects of early-life stress on HPA functioning are mediated by maternal care. Frequent human handling of the rat pups may cause their mother to exhibit more nurturant behavior, such as licking and grooming. Nurturant maternal care, in turn, may enhance HPA functioning in at least two ways. First, maternal care is crucial in maintaining the normal stress hypo responsive period (SHRP), which in rodents, is the first two weeks of life during which the HPA axis is generally non-reactive to stress. Maintenance of the SHRP period may be critical for HPA development, and the extreme stress of maternal separation, which disrupts the SHRP, may lead to permanent HPA dysregulation. Another way that maternal care might influence HPA regulation is by causing epigenetic changes in the offspring. For example, increased maternal licking and grooming has been shown to alter expression of the glutocorticoid receptor gene implicated in adaptive stress response. At least one human study has identified maternal neural activity patterns in response to video stimuli of mother-infant separation as being associated with decreased glucocorticoid receptor gene methylation in the context of post-traumatic stress disorder stemming from early life stress. Yet clearly, more research is needed to determine if the results seen in cross-generational animal models can be extended to humans. Though animal models allow for more control of experimental manipulation, the effects of early life stress on HPA axis function in humans has also been studied. One population that is often studied in this type of research is adult victims of childhood abuse. Adult victims of childhood abuse have exhibited increased ACTH concentrations in response to a psychosocial stress task compared to healthy controls and subjects with depression but not childhood abuse. In one study, adult victims of childhood abuse that are not depressed show increased ACTH response to both exogenous CRF and normal cortisol release. Adult victims of childhood abuse that are depressed show a blunted ACTH response to exoegenous CRH. A blunted ACTH response is common in depression, so the authors of this work posit that this pattern is likely to be due to the participant's depression and not their exposure to early life stress. Heim and colleagues have proposed that early life stress, such as childhood abuse, can induce a sensitization of the HPA axis, resulting in particular heightened neuronal activity in response to stress-induced CRF release. With repeated exposure to stress, the sensitized HPA axis may continue to hypersecrete CRF from the hypothalamus. Over time, CRF receptors in the anterior pituitary will become down-regulated, producing depression and anxiety symptoms. This research in human subjects is consistent with the animal literature discussed above. The HPA Axis was present in the earliest vertebrate species, and has remained highly conserved by strong positive selection due to its critical adaptive roles. The programming of the HPA axis is strongly influenced by the perinatal and early juvenile environment, or “early-life environment.”  Maternal stress and differential degrees of caregiving may constitute early life adversity, which has been shown to profoundly influence, if not permanently alter, the offspring's stress and emotional regulating systems. Widely studied in animal models (e.g. licking and grooming/LG in rat pups), the consistency of maternal care has been shown to have a powerful influence on the offspring's neurobiology, physiology, and behavior. Whereas maternal care improves cardiac response, sleep/wake rhythm, and growth hormone secretion in the neonate, it also suppresses HPA axis activity. In this manner, maternal care negatively regulates stress response in the neonate, thereby shaping his/her susceptibility to stress in later life. These programming effects are not deterministic, as the environment in which the individual develops can either match or mismatch with the former's “programmed” and genetically predisposed HPA axis reactivity. Although the primary mediators of the HPA axis are known, the exact mechanism by which its programming can be modulated during early life remains to be elucidated. Furthermore, evolutionary biologists contest the exact adaptive value of such programming, i.e. whether heightened HPA axis reactivity may confer greater evolutionary fitness. Various hypotheses have been proposed, in attempts to explain why early life adversity can produce outcomes ranging from extreme vulnerability to resilience, in the face of later stress. Glucocorticoids produced by the HPA axis have been proposed to confer either a protective or harmful role, depending on an individual's genetic predispositions, programming effects of early-life environment, and match or mismatch with one's postnatal environment. The predictive adaptation hypothesis (1), the three-hit concept of vulnerability and resilience (2) and the maternal mediation hypothesis (3) attempt to elucidate how early life adversity can differentially predict vulnerability or resilience in the face of significant stress in later life. These hypotheses are not mutually exclusive but rather are highly interrelated and unique to the individual. (1) The predictive adaptation hypothesis: this hypothesis is in direct contrast with the diathesis stress model, which posits that the accumulation of stressors across a lifespan can enhance the development of psychopathology once a threshold is crossed. Predictive adaptation asserts that early life experience induces epigenetic change; these changes predict or “set the stage” for adaptive responses that will be required in his/her environment. Thus, if a developing child (i.e., fetus to neonate) is exposed to ongoing maternal stress and low levels of maternal care (i.e., early life adversity), this will program his/her HPA axis to be more reactive to stress. This programming will have predicted, and potentially be adaptive in a highly stressful, precarious environment during childhood and later life. The predictability of these epigenetic changes is not definitive, however – depending primarily on the degree to which the individual's genetic and epigenetically modulated phenotype “matches” or “mismatches” with his/her environment (See: Hypothesis (2)). (2) Three-Hit Concept of vulnerability and resilience: this hypothesis states that within a specific life context, vulnerability may be enhanced with chronic failure to cope with ongoing adversity. It fundamentally seeks to explicate why, under seemingly indistinguishable circumstances, one individual may cope resiliently with stress, whereas another may not only cope poorly, but consequently develop a stress-related mental illness. The three “hits” – chronological and synergistic – are as follows: genetic predisposition (which predispose higher/lower HPA axis reactivity), early-life environment (perinatal – i.e. maternal stress, and postnatal – i.e. maternal care), and later-life environment (which determines match/mismatch, as well as a window for neuroplastic changes in early programming). (Figure 1)6 The concept of match/mismatch is central to this evolutionary hypothesis. In this context, it elucidates why early life programming in the perinatal and postnatal period may have been evolutionarily selected for. Specifically, by instating specific patterns of HPA axis activation, the individual may be more well equipped to cope with adversity in a high-stress environment. Conversely, if an individual is exposed to significant early life adversity, heightened HPA axis reactivity may “mismatch” him/her in an environment characterized by low stress. The latter scenario may represent maladaptation due to early programming, genetic predisposition, and mismatch. This mismatch may then predict negative developmental outcomes such as psychopathologies in later life. Ultimately, the conservation of the HPA axis has underscored its critical adaptive roles in vertebrates, so, too, various invertebrate species over time. The HPA Axis plays a clear role in the production of corticosteroids, which govern many facets of brain development and responses to ongoing environmental stress. With these findings, animal model research has served to identify what these roles are – with regards to animal development and evolutionary adaptation. In more precarious, primitive times, a heightened HPA axis may have served to protect organisms from predators and extreme environmental conditions, such as weather and natural disasters, by encouraging migration (i.e. fleeing), the mobilization of energy, learning (in the face of novel, dangerous stimuli) as well as increased appetite for biochemical energy storage. In contemporary society, the endurance of the HPA axis and early life programming will have important implications for counseling expecting and new mothers, as well as individuals who may have experienced significant early life adversity. 1 2 Malenka RC, Nestler EJ, Hyman SE (2009). "Chapter 10: Neural and Neuroendocrine Control of the Internal Milieu". In Sydor A, Brown RY. Molecular Neuropharmacology: A Foundation for Clinical Neuroscience (2nd ed.). New York: McGraw-Hill Medical. pp. 246, 248–259. ISBN 9780071481274. ↑ Selye, Hans (1974). Stress without distress. Philadelphia: Lippincott. ISBN 978-0-397-01026-4. 1 2 3 4 editors, volume; Besedovsky, Hugo; Chrousos, George; Rey, Adriana Del (2008). The hypothalamus-pituitary-adrenal axis (1st ed.). Amsterdam: Academic. ISBN 9780444530400. ↑ MacHale SM, Cavanagh JT, Bennie J, Carroll S, Goodwin GM, Lawrie SM (November 1998). "Diurnal variation of adrenocortical activity in chronic fatigue syndrome". Neuropsychobiology. 38 (4): 213–7. doi:10.1159/000026543. PMID 9813459. ↑ Backhaus J, Junghanns K, Hohagen F (October 2004). "Sleep disturbances are correlated with decreased morning awakening salivary cortisol". Psychoneuroendocrinology. 29 (9): 1184–91. doi:10.1016/j.psyneuen.2004.01.010. PMID 15219642. ↑ Pruessner JC, Hellhammer DH, Kirschbaum C (1999). "Burnout, perceived stress, and cortisol responses to awakening". Psychosom Med. 61 (2): 197–204. doi:10.1097/00006842-199903000-00012. PMID 10204973. 1 2 Marques-Deak, A; Cizza, G; Sternberg, E (February 2005). "Brain-immune interactions and disease susceptibility" (PDF). Molecular Psychiatry. 10: 239–250. doi:10.1038/sj.mp.4001643. Retrieved 13 February 2016. 1 2 3 4 5 6 Otmishi, Peyman; Gordon, Josiah; El-Oshar, Seraj; Li, Huafeng; Guardiola, Juan; Saad, Mohamed; Proctor, Mary; Yu, Jerry (2008). "Neuroimmune Interaction in Inflammatory Diseases" (PDF). Clinical Medicine: Circulatory, Respiratory, and Pulmonary Medicine. 2: 35–44. PMC 2990232 . Retrieved 14 February 2016. 1 2 3 Tian, Rui; Hou, Gonglin; Li, Dan; Yuan, Ti-Fei (June 2014). "A Possible Change Process of Inflammatory Cytokines in the prolonged Chronic Stress and its Ultimate Implications for Health" (PDF). The Scientific World Journal. 2014: 1–8. doi:10.1155/2014/780616. PMC 4065693 . Retrieved 13 February 2016. ↑ Hall, Jessica; Cruser, desAgnes; Podawiltz, Alan; Mummert, Diana; Jones, Harlan; Mummert, Mark (August 2012). "Psychological Stress and the Cutaneous Immune Response: Roles of the HPA Axis and the Sympathetic Nervous System in Atopic Dermatitis and Psoriasis". Dermatology Research and Practice. 2012: 1–11. doi:10.1155/2012/403908. Retrieved 14 February 2016. 1 2 Bellavance, Marc-Andre; Rivest, Serge (March 2014). "The HPA-immune axis and the immunomodulatory actions of glucocorticoids in the brain" (PDF). Frontiers in Immunology. 5: 1–13. doi:10.3389/fimmu.2014.00136. Retrieved 11 February 2016. 1 2 Padgett, David; Glaser, Ronald (August 2003). "How stress influences the immune response" (PDF). Trends in Immunology. 24 (8): 444–448. doi:10.1016/S1471-4906(03)00173-X. Retrieved 12 February 2016. ↑ Spencer RL, Hutchison KE (1999). "Alcohol, aging, and the stress response". Alcohol Research & Health. 23 (4): 272–83. PMID 10890824. ↑ Pariante CM (August 2003). "Depression, stress and the adrenal axis". Journal of Neuroendocrinology. 15 (8): 811–2. doi:10.1046/j.1365-2826.2003.01058.x. PMID 12834443. ↑ Douglas AJ (March 2005). "Central noradrenergic mechanisms underlying acute stress responses of the Hypothalamo–pituitary–adrenal axis: adaptations through pregnancy and lactation". Stress. 8 (1): 5–18. doi:10.1080/10253890500044380. PMID 16019594. ↑ Engelmann M, Landgraf R, Wotjak CT (2004). "The hypothalamic-neurohypophysial system regulates the hypothalamic–pituitary–adrenal axis under stress: an old concept revisited". Frontiers in Neuroendocrinology. 25 (3–4): 132–49. doi:10.1016/j.yfrne.2004.09.001. PMID 15589266. ↑ Detillion CE, Craft TK, Glasper ER, Prendergast BJ, DeVries AC (September 2004). "Social facilitation of wound healing". Psychoneuroendocrinology. 29 (8): 1004–11. doi:10.1016/j.psyneuen.2003.10.003. PMID 15219651. ↑ Winberg S, Øverli Ø, Lepage O (November 2001). "Suppression of aggression in rainbow trout (Oncorhynchus mykiss) by dietary L-tryptophan". The Journal of Experimental Biology. 204 (Pt 22): 3867–76. PMID 11807104. ↑ Coplan JD, Mathew SJ, Smith EL, et al. (July 2001). "Effects of LY354740, a novel glutamatergic metabotropic agonist, on nonhuman primate hypothalamic–pituitary–adrenal axis and noradrenergic function". CNS Spectrums. 6 (7): 607–12, 617. PMID 15573025. ↑ Miller GE, Chen E, Zhou ES (January 2007). "If it goes up, must it come down? Chronic stress and the hypothalamic–pituitary–adrenocortical axis in humans". Psychological Bulletin. 133 (1): 25–45. doi:10.1037/0033-2909.133.1.25. PMID 17201569. ↑ Kim JE, Cho BK, Cho DH, Park HJ (July 2013). "Expression of hypothalamic–pituitary–adrenal axis in common skin diseases: evidence of its association with stress-related disease activity". Acta Dermato-venereologica. 93 (4): 387–93. doi:10.2340/00015555-1557. PMID 23462974. ↑ Koehl M, Darnaudéry M, Dulluc J, Van Reeth O, Le Moal M, Maccari S (September 1999). "Prenatal stress alters circadian activity of hypothalamo–pituitary–adrenal axis and hippocampal corticosteroid receptors in adult rats of both gender". Journal of Neurobiology. 40 (3): 302–15. doi:10.1002/(SICI)1097-4695(19990905)40:3<302::AID-NEU3>3.0.CO;2-7. PMID 10440731. ↑ Weinstock M, Matlina E, Maor GI, Rosen H, McEwen BS (November 1992). "Prenatal stress selectively alters the reactivity of the hypothalamic-pituitary adrenal system in the female rat". Brain Research. 595 (2): 195–200. doi:10.1016/0006-8993(92)91049-K. PMID 1467966. ↑ Weinstock M (August 2008). "The long-term behavioural consequences of prenatal stress" (PDF). Neuroscience and Biobehavioral Reviews. 32 (6): 1073–86. doi:10.1016/j.neubiorev.2008.03.002. PMID 18423592. ↑ Gutteling BM, de Weerth C, Buitelaar JK (December 2004). "Maternal prenatal stress and 4-6 year old children's salivary cortisol concentrations pre- and post-vaccination". Stress. 7 (4): 257–60. doi:10.1080/10253890500044521. PMID 16019591. ↑ Buitelaar JK, Huizink AC, Mulder EJ, de Medina PG, Visser GH (2003). "Prenatal stress and cognitive development and temperament in infants". Neurobiology of Aging. 24 Suppl 1: S53–60; discussion S67–8. doi:10.1016/S0197-4580(03)00050-2. PMID 12829109. 1 2 Flinn MV, Nepomnaschy PA, Muehlenbein MP, Ponzi D (June 2011). "Evolutionary functions of early social modulation of hypothalamic–pituitary–adrenal axis development in humans". Neuroscience and Biobehavioral Reviews. 35 (7): 1611–29. doi:10.1016/j.neubiorev.2011.01.005. PMID 21251923. ↑ Liu D, Diorio J, Tannenbaum B, et al. (September 1997). "Maternal care, hippocampal glucocorticoid receptors, and hypothalamic–pituitary–adrenal responses to stress". Science. 277 (5332): 1659–62. doi:10.1126/science.277.5332.1659. PMID 9287218. ↑ Macrì S, Würbel H (December 2006). "Developmental plasticity of HPA and fear responses in rats: a critical review of the maternal mediation hypothesis". Hormones and Behavior. 50 (5): 667–80. doi:10.1016/j.yhbeh.2006.06.015. PMID 16890940. ↑ de Kloet ER, Sibug RM, Helmerhorst FM, Schmidt MV, Schmidt M (April 2005). "Stress, genes and the mechanism of programming the brain for later life". Neuroscience and Biobehavioral Reviews. 29 (2): 271–81. doi:10.1016/j.neubiorev.2004.10.008. PMID 15811498. ↑ Heim C.; Newport D. J.; Heit S.; Graham Y. P.; Wilcox M.; Bonsall R.; Nemeroff C. B. (2000). "Pituitary-adrenal and autonomic responses to stress in women after sexual and physical abuse in childhood". JAMA. 284 (5): 592–597. doi:10.1001/jama.284.5.592. PMID 10918705. 1 2 3 Heim C.; Newport D.J. ; Bonsall R.; Miller A.H.; Nemeroff C.B. (2001). "Altered Pituitary-Adrenal Axis Responses to Provocative Challenge Tests in Adult Survivors of Childhood Abuse". Am J Psychiatry. 158 (4): 575–581. doi:10.1176/appi.ajp.158.4.575. ↑ Denver RJ (Apr 2009). "Structural and functional evolution of vertebrate neuroendocrine stress systems". Ann N Y Acad Sci. 1163: 1–16. doi:10.1111/j.1749-6632.2009.04433.x. PMID 19456324. 1 2 Oitzl MS, Champagne DL, van der Veen R, de Kloet ER (May 2010). "Brain development under stress: hypotheses of glucocorticoid actions revisited". Neurosci Biobehav Rev. 34 (6): 853–66. doi:10.1016/j.neubiorev.2009.07.006. PMID 19631685. 1 2 Horton TH (Jan 2005). "Fetal origins of developmental plasticity: animal models of induced life history variation". Am J Hum Biol. 17 (1): 34–43. doi:10.1002/ajhb.20092. PMID 15611963. ↑ "Antenatal glucocorticoids and programming of the developing CNS.". Pediatr Res. 47: 291–300. Mar 2000. doi:10.1203/00006450-200003000-00003. PMID 10709726. 1 2 "Variations in maternal care in the rat as a mediating influence for the effects of environment on development.". Physiol Behav. 79: 359–71. Aug 2003. doi:10.1016/s0031-9384(03)00149-5. PMID 12954431. 1 2 3 Daskalakis NP, Bagot RC, Parker KJ, Vinkers CH, de Kloet ER (Sep 2013). "The three-hit concept of vulnerability and resilience: toward understanding adaptation to early-life adversity outcome". Psychoneuroendocrinology. 38 (9): 1858–73. doi:10.1016/j.psyneuen.2013.06.008. PMID 23838101. 1 2 Roth TL, Matt S, Chen K, Blaze J (Dec 2014). "Bdnf DNA methylation modifications in the hippocampus and amygdala of male and female rats exposed to different caregiving environments outside the homecage". Dev Psychobiol. 56 (8): 1755–63. doi:10.1002/dev.21218. PMID 24752649.